Sariah Skye physically resides with her family in southern Minnesota but mentally everyone is pretty sure she’s from Uranus. She’s a typical quirky Aquarian that swears too much, loves wine, shiny objects, and hates sarcasm and never, ever uses it. She also loves Star Trek, Doctor Who, ‘90s reruns, and Imagine Dragons (probably a little too much). In addition to all this oddity she’s an unprofessional obsessive fangirl, loves reading, hates anything domestic, and loves her pretty pink straitjacket. Oh, and she loves to chat with her unwilling kidnappees—err, “fans”, online at various places, like Facebook, Twitter, and Instagram .Or drop her an email at sariahskyeauthor@gmail.com or private message her on Facebook. 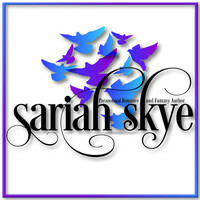 To ask Sariah Skye questions, please sign up. Hi when is the book insatiable coming out on audiobooks? Sariah Skye voted for Robbie (Confessions, #1) as Best Romance in the Opening Round of the 2018 Goodreads Choice Awards. We’d love your help. Let us know what’s wrong with this preview of Invisible by Sariah Skye. We’d love your help. Let us know what’s wrong with this preview of Fated Hope by Sariah Skye. We’d love your help. Let us know what’s wrong with this preview of Fated Magic by Sariah Skye.